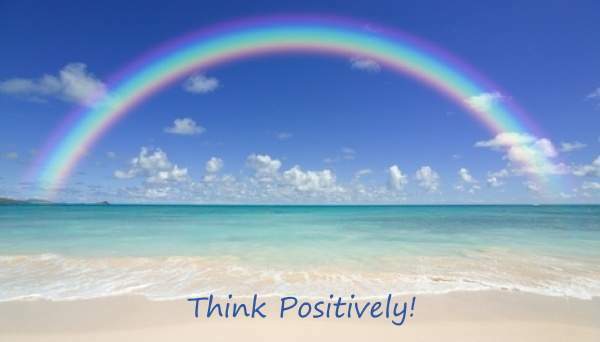 What does 'think positively' really mean? Quite often when we're going through a challenging time, or we're just plain miserable, we invariably get the advice to just "think positively!" Sometimes it's difficult to figure out exactly what that means. Does it mean to deny our pain or discomfort? Should we pretend everything is alright? Perhaps, at times, we would prefer to wallow. Surely there must be some merit in wallowing. Indeed there may be, (time heals most wounds) however, at some point we have to pick ourselves up and move on. In order to do so, we must change our mindsets, or attitudes, from being non-productive to those that are positive and progressive. Of course, we can't be in denial, or adopt a Pollyannaish, rose-colored glasses way of looking at the world. Negative feelings and circumstances do exist and often serve as an indication that something is not working, or needs attention. In such cases we must employ positive thinking and use it as a strategy for interpreting what happens to us in a useful, constructive way to make our lives work better. Of course, it doesn't mean denying pain and discomfort. It means making sense of them and using what we can to strengthen our resolve and build resilience muscle. Accept that you are here to grow and evolve. Life doesn't always go smoothly. Not everything is meant to be a joyride or exercise in pleasure. Life's lessons can be difficult, but are more so if you approach them with avoidance and apprehension. If you see them as opportunities to become stronger, wiser and more resilient, you are thinking positively and productively. Learn to turn lemons into lemonade. Look for the lessons to be learned in every situation. Instead of feeling sorry for yourself when things don't go your way, do what you can to make the best of the situation. Learn instead, how to avoid falling into the same traps and making the same mistakes. By doing so, you will undoutedly be the better for it. As James Joyce said: "A man's errors are his portals of discovery." Believe in yourself. Know that you have what it takes to succeed. Your dreams and goals are an indication where your talents lie and where your true potential is. Needless to say, you must develop your inherent gifts; however, recognize that you have a unique contribution to make. You're one of a kind. Acquire perseverance. When you possess a positive thinking mindset you never give up. You pursue your dreams, your goals and objectives with everything you've got and you don't settle for anything less. That's not to say you won't have roadblocks and various setbacks along the way. It just means that you won't let them stop you! Look for inspiration and support. Read about and study the triumphs of others. Many successful people have gone through challenging circumstances to get where they are. Learning about their trials and tribulations can motivate and inspire you to achieve that which you choose to achieve. To help you stay positive and focused, garner support from family and friends. Ultimately, thinking positively doesn't mean being unrealistic, or deluded. It means dealing with life and life's challenges as they are. It means willing to do the work necessary to get on with the business of living fully with everything it entails. So the next time a well-meaning person tells you to think positively, just smile back confidently and let them know that it's part of your everyday, productive mindset.